This is the story of Pawanputra Hanuman, the mighty monkey-god. Do you know how he was born? The story of his birth is as fascinating as his mighty deeds. But to know about Hanuman, we have to go back sometime before his birth. Let us go to the palace of Lord Brahma where it all started. Do you know who Lord Brahma is? He is the Hindu god of creation. He is believed to live in a beautiful divine palace in his heavenly abode. Such was the beauty of the palace that it was a constant source of amazement for even the deities. There were a number of attendants in the celestial palace-courts of Lord Brahma. Among them was a beautiful attendant named Anjana. Once, happy with her service, Lord Brahma decided to reward her. He called her and asked what she wanted. Anjana hesitated at first. Then she replied "Lord, I wish you could remove a curse pronounced on me by a sage,"
"Tell me about it. Maybe I can help you" said Lord Brahma. Hopeful that her curse may be removed, Anjana continued "When I was playing as a child on earth, once I saw a monkey meditating with its legs folded in a lotus pose, like a human sage. It was a funny sight; so I threw some fruits at it." "But here I made a mistake. For it was no ordinary monkey. A powerful sage had taken the form of a monkey to do his tapasya (spiritual practice). My fruits disturbed his penance and he opened his eyes in great indignation." "As soon as he saw me, he cursed me that I would become a monkey when I fall in love with anyone. I begged him to forgive me." "The sage said that as he had already uttered it, he couldn't change the curse. But he assured me that the man I fall in love with will love me in spite of my monkey face." "Lord Brahma, I was born and brought up here. How can I live with a monkey face among my beautiful sisters? If you kindly grant me a boon to become my usual self, I will be very much obliged," she said anxiously. Brahma felt sorry for the unfortunate apsara. He thought for a moment. Then he lifted his eyes towards the anxious Anjana. "I see a way for removing your curse, Anjana," he said kindly. "Go to earth and live there for a while. You will meet your husband on earth and your curse will be removed if you - give birth to an incarnation of Lord Shiva," said Lord Brahma. Anjana accepted Brahma's advice. She was born in the earth shortly afterwards. She lived in a forest as a young huntress. One day she saw a strong man fighting with a lion. "What a brave man!" she thought in wonder. "How I wish he will look at me!" As Anjana looked at the warrior in admiration, the man turned and saw her. As soon as his eyes fell on her, she turned into a monkey! With a pathetic cry, Anjana sank to the ground and covered her face with her hands. Seeing her fall to the ground, the man came running towards her. "Who are you fair maiden? Why do you cry? Uncover your face. Let me see you," he asked her. "I cannot, brave man," Anjana answered gloomily. "I am Anjana, an apsara cursed to become a monkey when I fall in love. I request you to please leave me alone in my sorrow," she wailed and peeked at the handsome man through her fingers. To her great astonishment she found a big monkey-faced man standing before her! If she didn't see his face at first, it was because she couldn't and because till now she saw him from a distance. The monkey-faced man understood her surprise. He spoke. "I am not human, though I can take the human form if I want. I am Kesari, the king of Monkeys, blessed by Lord Shiva with magical powers. If you become my wife, I will be honoured. Would you honour me by becoming my wife, dear Anjana?". Anjana became very happy. She accepted his proposal. "Then the sage's word was indeed true," thought Anjana, "Kesari didn't mind my appearance because he himself is a monkey!" Anjana and Kesari were married in the forests. Being a pious devotee, Anjana performed intense tapasya, worshipping Lord Shiva. Lord Shiva was pleased with her. He appeared before her and asked her what she wanted. "Lord Shiva, I wish you to be born as my son, so that I can be freed from the sage's curse," requested Anjana. "So be it!". Lord Shiva gave his consent and disappeared. Soon after this, one day, as Anjana was worshipping Lord Shiva, in another part of the country, Dasaratha, the king of Ayodhya, was performing a yagna (religious rite) to have children. It was the Putrakama Yagna. As a result, Agni, the Fire-God gave him some sacred payasa (pudding) and asked him to share the payasa among his wives so that they may have divine children. Here, Lord Shiva's boon to Anjana started to work. While Dasaratha gave payasa to his elder wife Kausalya, by divine ordinance a kite snatched a portion of that pudding. Holding the pudding in its tails, the kite-bird flew away from Ayodhya towards the forests Anjana lived. It flew over the dense trees and dropped the payasa where Anjana was engaged in tapasya. Vayu, the ever-present Wind-God, saw this event. "Go, Vayu!" he heard a silent command in his mind from Lord Shiva. Vayu immediately caught that portion of pudding and placed onto the outstretched hands of Anjana. Anjana felt something drop in her hand. She opened her eyes and looked at the payasa in her hand. "Is this offering from Lord Shiva?" she wondered and swallowed it. As the divine pudding went inside her throat, Anjana immediately felt the blessings of Lord Shiva. In due course, she gave birth to a little monkey-faced boy. Kesari was very happy to see his son. The child was called as Anjaneya or the son of Anjana. Having given birth to Lord Shiva's incarnation, Anjana was released from the curse of the sage. She began to express her wish to return to Heaven. When Anjaneya came to know about her mother's wish, he became sad. "Mother, without you what will be my future? How can I feed myself? How will I live?" he asked. "Don't worry, Anjaneya," said Anjana. "Your father is the brave Kesari. Your guardian spirit is the life-giving Vayu. They'll always protect you. When you feel hungry, fruits as red and ripe as a rising sun would be your nourishment." Saying so, Anjana kissed her son and left her alone. She went back to her heavenly abode. "Fruits as red and ripe as the sun?" thought Anjaneya. "Is sun such a ripe fruit? Let's see!" Thinking that the sun was actually some delicious fruit, the baby Anjaneya wanted to taste the sun. Now, Anjaneya was a divine child. His mother was an apsara and his father was a Monkey-King, so it was natural that little Anjaneya should inherit some magical powers. He was, after all, an incarnation of Lord Shiva. So reaching for the sun was not a tough task for him. He made a giant leap to catch the glowing ball on the sky. Suryadeva, the Sun-God was glowing peacefully in the sky when he suddenly saw a monkey coming towards him. The monkey grew bigger and bigger as he neared the sun. But the terribly hot rays which made any mortal presence impossible near the sun, had no effect on the creature. Seeing that, Suryadeva got scared and started calling out for help. "Indra! Indra! Help me!" he shouted. Indra, king of the gods in heaven, was resting nearby in his heavenly abode. He was surprised to hear the Sun-God pleading for his help. "Why is Suryadeva yelling for my help?" Indra wondered. "Is he not powerful enough to burn everything that comes near him? Or is it something beyond his control? I have to see what's happening!" Indradeva promptly climbed on Airavatha the white elephant, his mount, and left his abode to find the cause of Suryadeva's fear. Soon he found that a flying monster was trying to catch hold of the sun. "Little wonder then that Suryadeva was so scared!" thought Indra, who had never seen such a creature. Nearing the sun, Indra was surprised to see that the monster was actually a giant monkey. "Stop!" he ordered. "Who are you? Why are you trying to catch the sun?" "I'm Anjaneya, son of Kesari and Anjana." replied the giant child. "My mother told me that fruits as ripe as the red sun will be my food so I'm going to catch the sun and eat it." At first, Indra was amused by the child's innocence, so he advised him to return to earth. "This is not a fruit, Anjaneya, this is the sun- the source of all light and life." said he and commanded, "Return whence you came". 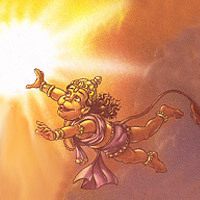 But naughty Anjaneya ignored his commands and continued on his journey to capture the sun. Now Indra became angry at the child's impertinence. He warned him several times not to go near the sun, but Anjaneya did not listen to him. Finally, the King of Devas became so enraged that he struck Anjaneya with his thunderbolt "vajra". Kaaabuuuuuuum!!! The thunderbolt hit the child, wounding his chin and causing him to fall down to earth. The "vajra" hit Anjaneya's face. So his cheeks were swollen twice its size. As the boy fell, his body became smaller and smaller. Finally he became the child-sized monkey he really was and hit the ground. Vayu, the Wind God, was roaming here and there when he heard a big "thud". Curious, he went towards the direction of the noise to investigate. What he saw shocked Vayu. He couldn't believe his eyes. Anjaneya was lying unconscious on the ground. Who had dared to injure his god-son? "Who has done this?" he roared but no one answered. Indra had already left for his abode and the sun was once again peacefully glowing in the sky. The Wind God was terribly angry. "Why should I bother to do my duty when no one answers my question?" he thought. With great affection, he lifted his godson in his hands and went to the Patalloka, the world below the grounds of the earth. As Vayu left the earth, there was no air in the world. People, animals and trees struggled to breathe and started to die. The Sun-God was shocked at the turn of the events and he ran to Brahma, telling Him about the calamity on earth. Brahma became worried about the situation on Earth. He called Indra and accused him. "Look what your silly anger has caused!" he thundered. "You have hurt a divine child and now the people on earth are suffering because of your mistake. This is all because of you!". Indra hung his head in shame. "I am sorry for my actions" he murmured. Brahma took him and the other gods to Patalloka and begged Vayu to return to earth. "I beg pardon on behalf of all men, all creatures and divine beings. Please return to the earth, o gentle Vayu." "I'll not come anywhere without my Anjaneya", Vayu said firmly. Then, using his powers, Brahma magically cured Anjaneya's wounds. He also gave him a boon saying, "No weapon will be ever able to have an effect on Anjaneya again." To please Vayu further, Indra said to the boy, "You will be a 'Chiranjeevi' (immortal). I had taken my aim in your hanu (cheek). So from now, you will be called as the valiant Hanuman!" Thus Anjaneya came to be known as Hanuman and had many more adventures during his childhood. With the blessings of all the gods,Hanuman became a great warrior later and had helped Lord Rama in his quest to bring back the latter's wife, Sita. This incident is known to everyone and is recorded in the great epic called Ramyana.